Extract the pidgin-awn.so from the archive to ~/.purple/plugins. Create a launcher for Pidgin on AWN, launch it, right click on the Pidgin tray icon and select Plugins. Enable AWN plug in. Extract the theme archive(s) in the temporary folder. Now, as root, move the "pidgin" folder to /usr/share/pixmaps. Overwrite the existing one after taking a backup. This will install the OS X Theme for Pidgin. Remember to reinstall this theme whenever you perform a Pidgin upgrade as the upgrade will revert back to the default theme. You will need to have Exaile Media player installed to use this. To install this Plugin, copy both the awn.py and awn.pyc files to ~/.exaile/plugins. Launch Exaile, goto the Plugins dialog, enable AWN Plugin. The status will now be shown on the Exaile launcher on AWN (you need to create an Exaile launcher on AWN first). NOTE: Some users have not been able to use this Plugin. Hence it may or may not work for you. Extract OSX Sounds archive to a temporary folder. 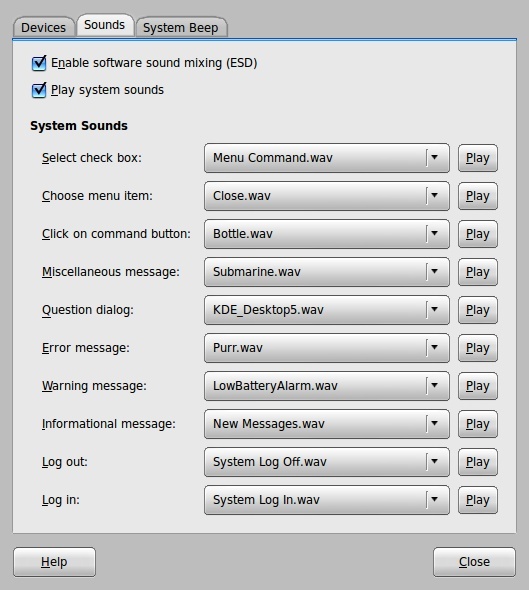 Copy OSX Sounds folder to /usr/share/sounds, as root, for easily applying Mac Sounds.